FarmVille was designed to be a social game so that folks would reach out to friends and even make some new friends through game play. There are a lot of benefits in getting friends and not–yet–friends to start up in the areas around one's farm. This makes it easier to expand the business part of the farm and eventually own more land. There are a lot of forums and blogs out there filled with folks literally begging for neighbors to join their community. Most of those people looking for neighbors will usually offer gifts, or the promise of future gifts in exchange for becoming a neighbor. Another way to get neighbors is to just ask those players who are on the same level. Remember, the better the level of neighbors, the better the gifts. 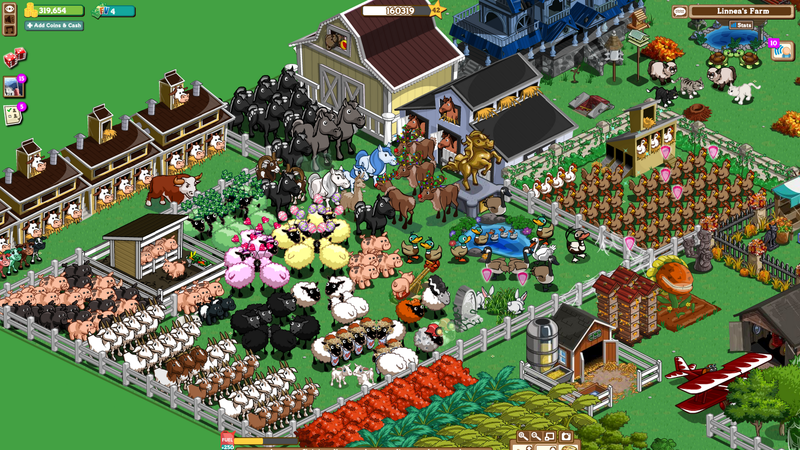 One of the tricks to leveling faster in FarmVille is to keep the FarmVille–money flowing. While setting aside some money for expenses, use as much money as possible to plow, plant, and harvest the good coin–producing crops as soon as money gets low. There are places online that provide tables listing the best coin-producing crops. For example, "Super Berries" harvest in just two hours and sell for 100 coins. These berries are very rare, but do occasionally pop up in the game. Look for other pop–ups that will show up when visiting neighbors farms asking about weeding or some other job which needs doing. It's not glamorous work, but it keeps the cash coming in. Hay bales get 5 XP each so buy as many as possible. Delete those bales and then buy more to get the Pack Rat Ribbon. Get an Architect Blue Ribbon by building as many restrooms as possible. Focus on buying horses, ducks, rabbits, and goats which get 50 coins each. The highest yielding trees are Banana, Passion Fruit, and Pomegranate bringing in 100 coins each. In the early stages of FarmVille, crops definitely offer the best return on experience points. However, as the game progresses with more gifts and friends acquired, try and get more valuable animals as gifts from neighbors and friends. Chocolate milk from a brown cow or wool from sheep does not go bad like other crops. This is especially useful for people who are busy and may not be able to visit the farm for a time. The first level in FarmVille is the lowly Field Hand at level 1–0XP. There are many, many levels in the game including Livestock Lord, Jolly Rancher, Green Giant, Killer Tiller, Old Mc–Who, and Farming Virtuoso. The top level which is World Fair Champ is at level 70 and requires over 4.3 million experience points. There are some time consuming tasks in FarmVille can be automated. Plowing, seeding, and harvesting hundreds of squares can be boring and make the old arthritis kick in early. If players can't be on the farm regularly, it makes sense to automate some of these tasks in order to keep crops from being wasted. Look online for some free FarmVille scripts like Extreme FarmVille Manager or Farm Helper. Of course, for those who want to take FarmVille to a whole new level, take a look at the FarmVille Secrets Guide available online. This guide takes a walkthrough of the entire game through all the different levels showing which animals are best buys at various levels, which crops to plant and when, and how to become a rich farmer faster. Be careful of any offers from others or websites that may offer game cheats or hacks of FarmVille. The game was designed to engross players in the particulars and intricacies of real–time online farming. Remember that if any cheats are used, Facebook may place a ban on any or all online Facebook games.